If you’ve been considering a tiny house it is probably the low cost and simple upkeep that has attracted you to this type of home, or maybe you just want a small home and a simple life. Either way, due to the size of tiny houses, sourcing recycled materials is much easier than doing so for a typical sized home. For example, if you were trying to find sheet metal roofing for a typical roof on a larger home, you would need long sheets and likely a couple thousand sq ft, with a tiny house, the amount needed may be only 200 to 300 sq ft. In addition, you would not need long sheets in most cases and recycled sheets could have damaged ends trimmed off, rusty sections removed and so on. 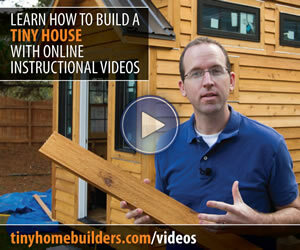 You won’t need a large supply, and could easily acquire enough roofing from a garage demolition (or small house) to get enough material for a tiny house. The same will apply to used kitchen cabinets or wood flooring. For example, a typical kitchen may contain 15 to 20 cabinets of which you may only need several. This allows you to choose the best ones and those that may fit into your design. 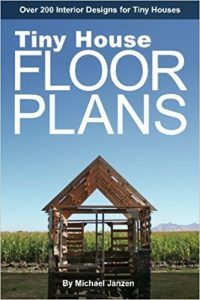 The same applies to wood flooring, if you were to rip out 200 to 300 sq ft from a house demolition or someone who is simply replacing their flooring, you will likely be able to save enough good boards for a floor in a tiny house. In almost every aspect of tiny home construction it is much easier to acquire recycled materials in enough quantity for use in the home. Even old fencing or similar wood can be salvaged and used. 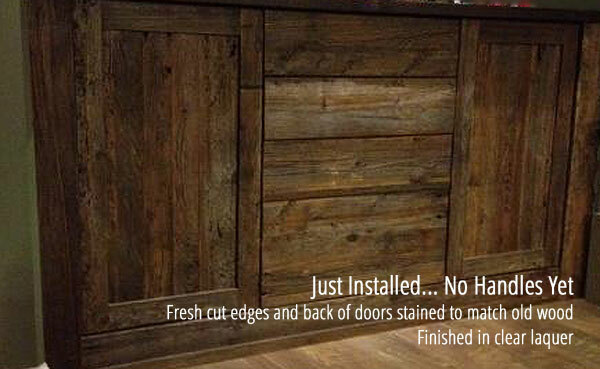 I recently built doors and drawer fronts for family room cabinets made from old rotting fence boards – the results worked out very well (see images below). 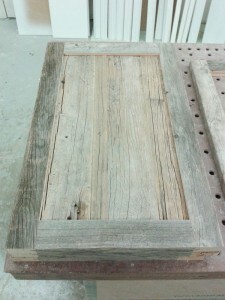 This is how the finished product turned out – rustic and solid! I included the pictures above to show that even the oldest, possibly rotting wood can be recycled (although you may have to cut out lots of bad sections). However, that does not mean you have to go rustic. You can use old wood for modern finishing too. 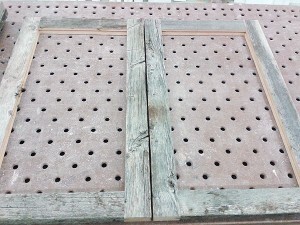 The image below is window trim I made for my son’s kitchen using alder salvaged from pallets. A year later, the trim is still rock solid (and painted now). The trick with pallet materials (the boards removed and stacked) is to let them condition in a warm, dry location for at least 3 to 4 weeks before you use them. In this time frame, any boards that are likely to warp or crack will and you can use those for other things that they may be suited too – in some cases, firewood. If you have trouble removing boards without damage, cut off the usable material from the pallet with a circular saw (works best on large pallets used from large crates etc). Now all that said, I should point out that there are a few power tools worth investing in if you want to convert rough or damaged wood into nice finished and smooth boards for use in a tiny house – or anywhere for that matter. The first is a minimum 6″ jointer. It does not have to be top of the line or new (auctions are good place to check), but if you are planning to buy one, checkout the Jet 6″ Jointer on Amazon (or any one that fits your price range – although, if you plan to use it a lot, stick with Jet, General [not General International]or Powermatic). A jointer is a must for getting a straight edge on planks and flattening curved planks. The next tool that is a must have is a thickness planer and this can be a portable type unless you can afford better and want a stationary model. I personally like these Dewalt Thickness Planers (all are highly rated on Amazon and lots of reviews to look at) They are reasonably priced and should provide all the planing you need to do for at least one tiny house – but likely will do many more. There really is a lot of recyclable materials that can be used in a tiny house, you just have to know what you need and keep your eyes open for opportunities to get them. Even posting or checking ads on Craigslist or similar websites can pay off handsomely. You also need to be prepared to do lots of extra work to use these materials, but you can save a ton of money and help keep these items out of the dumps (Landfill). Of course, having the right tools helps as noted above. Most importantly though, is to be creative and open to using used materials, and being ready to change things up for your tiny house if you make a good score on recycled materials. Design your house and then keep your eyes open for the items you know will work for your house plan and design.